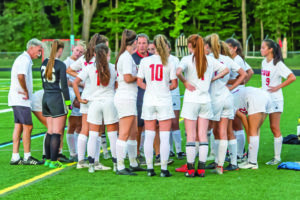 CVU soccer coach, Stan Williams talks to his troups prior to their game vs South Burlington on Firday evening in So Bulington. 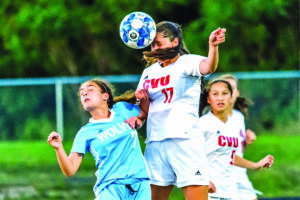 CVU’s Quinn Boardman outleaps her So Burlington opponent for a header during their game on Friday evening in So Burlington. CVU’s Sydney Jimmo gets by her So Burlington opponent during their game on Friday evening in So Burlington. 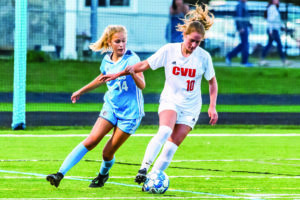 CVU’s Catherine Gilwee battles her So Burlington defender for possession during their game on Friday evening in So Burlington. 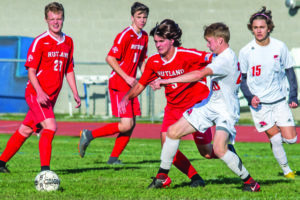 Two goals from Sam Johnson lifted the Champlain Valley boys soccer team to a 4-0 win over Rutland in Essex’s Jay Brady Kickoff Classic on Saturday. 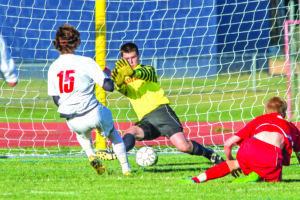 Cullen Swett, Chase Mitchell and Johnson each had a goal in the victory over Rice, and Johnson made three saves for his third shutout of the season. 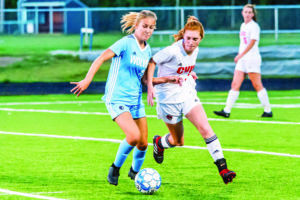 The Champlain Valley Union High School girls soccer team continued its hot start Friday, defeating host South Burlington 2-0 for its second win of the young season. Olivia Zubarik had both goals for the Redhawks, who improved their record to 2-0. Catherine Gilwee had the assist on both tallies, while Maryn Askew made five saves to earn the shutout. Rutland 41, Champlain Valley 12: Rutland opened up a 27-0 lead and never looked back in a win over the Champlain Valley football team on Friday night. Seth Boffa paced the Redhawks, running for 130 yards and two touchdowns, but the visitors ultimately fell to 0-2 this season. Champlain Valley 5, Middlebury 1: A win Thursday over Middlebury has the Champlain Valley field hockey team off to a 2-0 start. 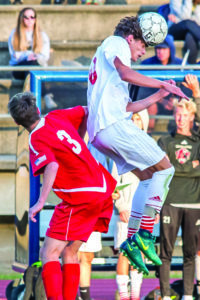 Lena Ashooh and Flynn Hall each tallied twice for the Redhawks. 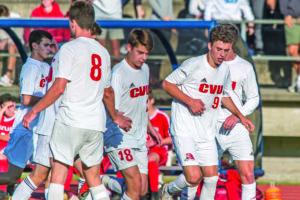 Janie Hardy also had a goal for CVU, while Kristy Carlson earned the win in goal. Champlain Valley 3, Vermont Commons 0: The Champlain Valley boys volleyball team began its title defense with a straight-set win over Vermont Commons last week.